York Coffee RTA Kitchen Cabinets from Walker's Mill have a beautiful brown coffee hue and black glazing. The sturdy cabinets have hardwood doors and face frames, 3/4 inch plywood shelves and natural maple dovetail drawer boxes. Walker's Mill York Coffee Cabinets are ideal for multi-family housing, modern kitchens or anywhere a traditional kitchen is required. And, these ready to assemble kitchen cabinets are always in stock and available to ship quickly. These Cabinets are value-priced. 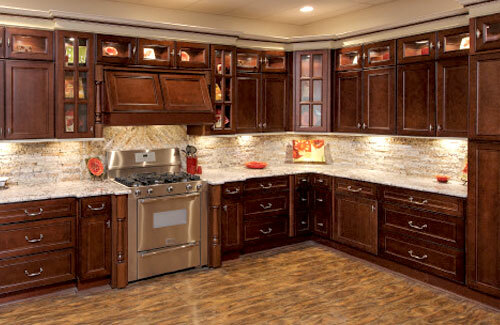 Walker's Mill makes it easy to buy and shop Online Kitchen Cabinets.